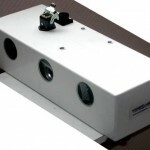 Since 1999, VIDEOMETRIC designs automatized industrial systems and precisely measures distances, positions and volumes. Numerous vehicles (Cars, trucks) are equipped with Emergency Braking feature. Permanent forefront car distance calculation and obstacle detection help to avoid or reduce car accident consequences. AEBS (Automatic Emergency Braking System) systems use millimetric wave radar sensor, located behind car front grid. It is mandatory to verify initial mounting, to control radar detection efficiency. Part of the production line, VIDEOMETRIC system closely involve proprietary 3D Vision & Augmented Reality tools to control radar position against grid and emission axis. 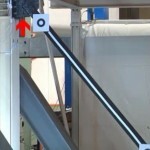 Adding the AR radar emission cone onto emission axis, system can detect a possible grid interference, calculates cone centering data, being recorded in the production system. In manual mode, operator instantly visualizes in 3D mounting quality and the real radar cone position, added in Augmented Reality. Intralogistic system, automatizing pharmaceutical boxes picking & packing for order fulfillment purposes. Guided by the 3D Vision system, the robot is picking one by one fragile medics boxes from specific containers, and drop them in customer pack. Precisely guided by the 3D Vision system, the robot picks up 2 hot annealed aluminium parts (400°C) whatever are their position on furnace exit. 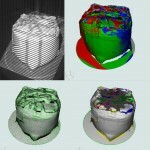 4 stereoscopic poles are digitizing wastebags. 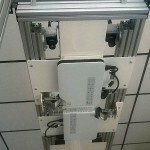 Automatic "constant weight" cutting system, for cylindric cheese processing. 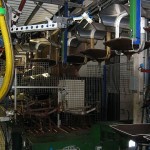 First system installed in 2010, in a major food processing company. 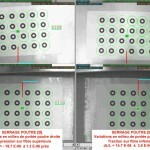 Image registration: Precision up to 500th of a pixel, then 3D distortion data is stored for further analysis. 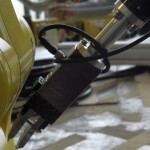 Robot handles each metallic bar, nevertheless its position, orient and place it onto the tooling machine. Part basket is totally emptied.